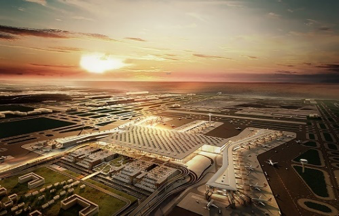 EVERLAM is proud to be selected as the sole supplier of PVB for phase 1 of the New Istanbul Grand Airport, planned to be one of the largest in the world. 500,000 sqm of EVERLAM™ clear 1.52 mm are used in the laminated safety glass that will equip the facade of the vast new terminal building, the world's largest under one roof, as well as five pier buildings. This glass project is managed in partnership with Sisecam.